I always find it interesting to get to know the person behind (often alongside) "the person". In this case, the wife of writer/poet Raymond Carver. 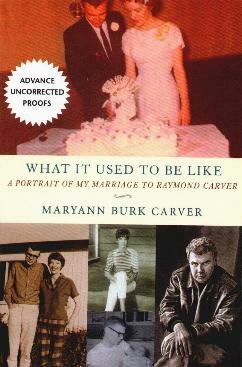 Maryann Burk Carver tells her side of their intriguing life story, from their meeting as teenagers and their blossoming romance, to their hopes and ideals for their future. Young Raymond was sure he was going to be a writer while Maryann wanted to become a lawyer. She recalls their dates and common interests (for example, they both loved reading) in Washington State, their marriage as expectant teenagers, being teenage parents, their dreams, their financial struggles, and the constant moving from home to home. By the early 1960s, Ray was working and taking writing classes, Maryann was working and taking care of her family, and later, trying to squeeze in an education when she could. Learning about how a great writer got his career off to a start was inspiring, however, not something one would like to imitate. Patterns emerge early in life and we don't always recognize the potential hazzards, be they family, inherent, learned, or acquired. It was also interesting to read about their immediate families, making the Carver/Burk story fit together like one big puzzle. The book is broken up into decades, and starting with the 50s, we're treated to an up close and personal peek into the lives of an ever-moving, city to city, place to place, ever-changing and evolving, and growing family. Of course, Maryann Carver details the rise and fall of their drinking.